Argyle Winery's history is a quintessential Oregon tale, complete with the promise of staking claim to new spaces, taking risks, and embracing opportunities and possibilities. 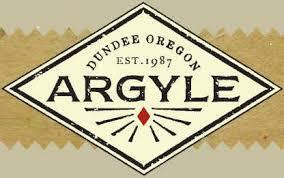 Like so many Oregon enterprises, Argyle draws its roots from other cultures and their customs. The Argyle story began with a Texan winemaker named Rollin Soles and a Kentucky viticulturist, Allen Holstein, and their shared vision to create wines that are a reflection of the place and of the craft. More than 25 years later, Argyle Winery is a highly respected Oregon producer of méthode champenoise Sparkling wine, silky Pinot Noir, barrel aged Chardonnay, and Riesling. While Oregon Pinot Noir enjoys a sense of awareness among wine lovers worldwide, Sparkling wine is actually the wine that sets Argyle apart. Argyle Winery has been producing Sparkling wine since its beginning in 1987. The philosophy shared by the winemaking team is that the knowledge gained by making the more difficult, highly acclaimed Sparkling wines leads directly to making better decisions about still wine production. Argyle farms more than 500 Oregon acres split between the red volcanic Jory soil of the Dundee Hills AVA and the wind-battered slopes of the Eola-Amity Hills AVA (about 15 miles south of the winery and tasting room). The vineyards are Certified Sustainable by LIVE (Low Input Viticulture and Enology), and Argyle Winery itself was one of the first in the state to be certified by the organization. James Suckling 94 "This focused pinot noir shows aromas of jasmine, hibiscus, and white lotus. Dried strawberries and plums too. Medium body, firm and velvety tannins and a vibrant finish. I like the tannin tension here and austerity. Delicious now but better in 2019.” Vinous 94 “Vivid red. Wine Spectator 93"Firm and refined, with baby powder-like tannins around the raspberry, strawberry, peach skin and hibiscus notes. Comes together harmoniously on a sleek and transparent frame, finishing long. Best from 2018 through 2024. 7,400 cases made." Wine Spectator 89"Crisp and precise, with apple and pomelo aromas and sleek, tangy flavors that finish with vibrancy. Drink now."